It’s useful to know what’s driving intermediate term trader positioning behind the EURUSD. Unlike shorter term traders who are in and out of their positions in a matter of hours or days, these traders aren’t focused purely on technical analysis or short term news plays. Instead, this group is speculating on fundamental trends and changes in the monthly calendar events, particularly Fed and ECB policy, as well as the reports that are believed to influence these leading central banks. In other words, the changes in the long-short positioning ratios can at times yield insights into sentiment on the key fundamental drivers of the pair. This group is also a good one for newer forex traders to watch. For reasons I discuss in depth in my book, newer traders have a much better chance of success by trading off of longer time frame charts (4 hour, daily, weekly, or monthly) with planned holding periods spanning weeks or months. 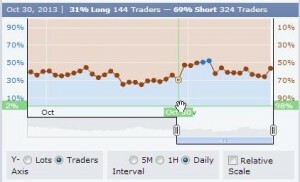 I came across this as part of my mandate here at www.fxempire.com to periodically cover new trader tools. What’s driving sentiment for these longer term traders, particularly regarding the fundamentals that they watch more than short term traders who are in and out of positions in no more than a few days or hours. Those traders are focused on solely on technical analysis or specific news event based trading. The prevailing range of the long/short positions ratio. When positioning exceeds the extremes of the range, that gives you an oversold/overbought indicator. The following are some observations gleaned from studying the daily EURUSD long/short positioning. On October 30th we had the “Fed Fake,” the FOMC minutes raised the odds of an earlier QE taper. That was good for the USD, and thus bad for the EUR, both because a stronger dollar weakens the EUR, and because the prospects of less stimulus hurt risk appetite, again weakening the EURUSD, which tends to move up and down with overall risk appetite. Not surprisingly, the daily price charts the EURUSD dropped hard on from October 30th to November 1st. 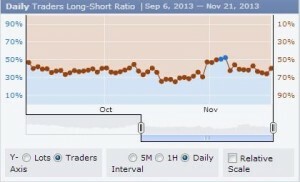 The long/short ratio jumping from 31% long and 69% short (chart 1) to 50% long and 50% short (chart 2). 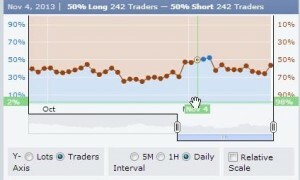 Not only did the number of short positions fall from 324 to 242, as traders took profits, the number of long positions increased from 144 to 242. As we noted here, EURUSD traders had correctly anticipated that expectations had become too optimistic for a longer period of QE before any taper began. The EURUSD had been coming falling since October 28th. Indeed we see the ratio of shorts to longs growing throughout the prior month. The shift in the long short ratio was not just due to shorts closing out positions. Instead, we had a combination of the EURUSD short traders taking profits and, surprisingly, new long positions too. Note how, from chart 1 to chart 2, not only did the number of short positions fall, the number of longs also increased. Another is that a portion of these intermediate term traders saw the Fed’s hawkish surprise as not only a time to take profits on short positions, but also to establish new long positions at what they saw as a favorable price. Apparently they were anticipating some kind of EURUSD bounce. Certainly there was an argument to be made for such a move. The ECB was not expected to make any policy changes, and there were real concerns that the coming US Q3 GDP and monthly jobs reports would be weak, especially considering the possible damage from the recent US federal government shutdown. The US GDP beat increased early QE taper fears in yet another “good news is bad news” move, so risk appetite dropped in both Europe and the US, as shown by the declines in both European and US indexes, AND the USD got a boost from rising odds of a taper sooner rather than later. The bearish early taper fear overpowered the bullish effect of the ECB rate cut, even in European stock indexes. As we see from chart 3 below, these events returned the EURUSD medium term traders’ long short ratio back down to 38% long/62% short. There are no surprises here. The ECB signaled easing, and the US data signaled a rising chance of tightening sooner than expected. We would expect traders with these typically 7 week holding periods to be firmly influenced by shifts in such basic fundamentals as policy shifts of the ECB and Fed. This was the start of a slow but steady drop back to the roughly 35% long/65% short positioning ratio we had seen since mid-September, as shown in Chart 4 below. Medium term EURUSD traders remain modestly overall short. Again, this is not surprising given the continuing flow of evidence that the ECB is considering additional easing, while the Fed is expected to begin cutting back its QE in the coming months. However the extent and timing of that move in favor of the USD is unclear, hence the only modest short bias of the medium term traders. As long as the ECB continues to make clear their dovish policy bias and willingness to increase stimulus if needed (likely given the EU’s overall weakness and deflationary risks), and the Fed moves in the opposite direction, the longer term bearish trader positioning bias for the EURUSD should continue, as ECB policy undermines the EUR and Fed policy supports the USD. We don’t expect that short EURUSD bias to become stronger unless USD interest rates make a sustained move higher (benchmark 10% treasury note yields move decisively over 3%). Meanwhile, the continued overall dovish Fed policy and continued strength in US and European stocks suggests continued risk appetite that should continue to limit longer term EURUSD trader shorts and keep the current long/short ratio within its current 30% – 50% band for the coming weeks, barring any big surprises in US data, Fed, or ECB policy. However, as suggested in chart 4 above, any dips in the long/short ratio below 30% long should be seen as a sign of short term buying opportunity. Similarly, when longs hit the 50% area, that’s a signal of a possible coming drop in the number of long positions and thus in the EURUSD itself. 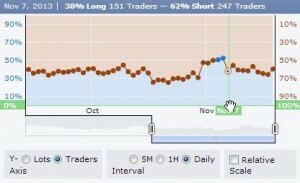 The forexfactory.com “Positions/Live Accounts” charts of long/short ratios provides a helpful barometer of retail trader positioning. Although the sample is small, it is displayed in real time. So although you wouldn’t base your trading decisions solely on these positioning ratios, they can be a helpful additional indicator to consider in your trading decisions.